A significant and very dedicated cross-section of Outlander fans will be celebrating this Saturday and Sunday night when “The False Bride,” Outlander’s third episode, airs. Roger Wakefield (Richard Rankin) and Brianna Randall (Sophie Skelton) return to pick up their story in 1970 America, while Claire (Caitriona Balfe) and Jamie (Sam Heughan) take their leave of River Run to find their own place in 18th century North Carolina. 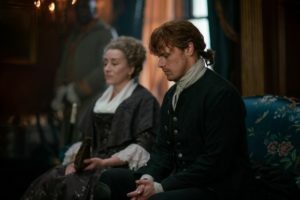 Despite the bumps in the road for both couples, this episode moves at a—shall we say—a deliberate pace, especially in the Claire and Jamie section. 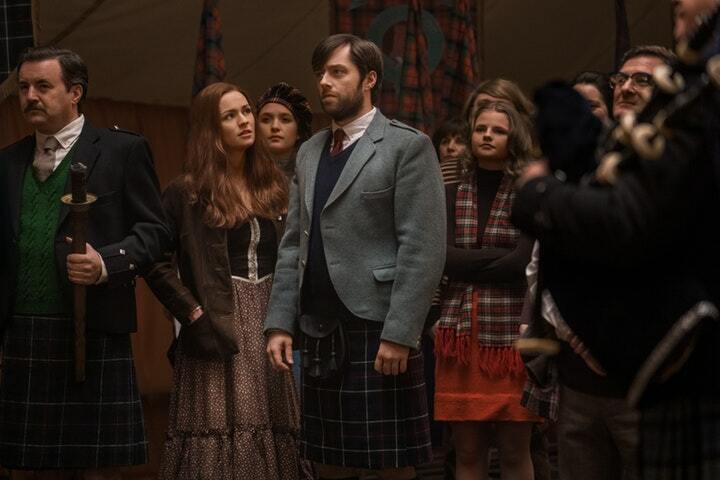 After last week’s catastrophic (and controversial ending), the Frasers have decided to turn down Aunt Jocasta’s (Maria Doyle Kennedy) offer of a home and financial security. She might be sad that her reunion with her nephew is short-lived, but she understands the reasons for the couple’s departure. 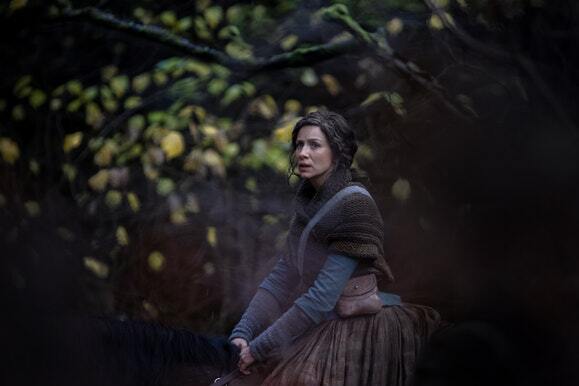 It will occur to anyone who’s followed the Frasers’ exploratory journey through the North Carolina woods that Claire doesn’t do well around trees. Once again, Jamie asks Claire to NOT do something, which she (of course) ignores and proceeds to get herself in trouble, what has become a rather repetitive plot point four seasons into the story. This time, Claire’s disregard results in the most intriguing moment in the episode…the discovery of a skull with a very modern silver filling in its mouth. 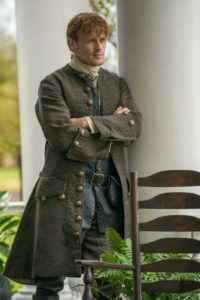 This is hardly a spoiler since the revelation is prominent in the Season 4 trailers, but the best and spookiest moment in the episode is tied to Claire’s realization that there is proof of yet another time traveler. 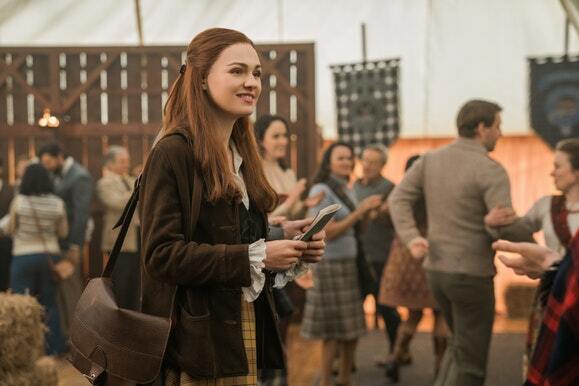 On the Roger/Bree front, it is encouraging to see a much improved performance from Skelton in this chapter of the story, as the actress seems to be growing into her part and her heretofore spotty American accent. Perhaps it has something to do with the fact this is finally Brianna’s story, separate and apart from her mother’s. As the character moves into adulthood and must consider her own future with Roger, or without—Skelton seems more sure-footed in the role. 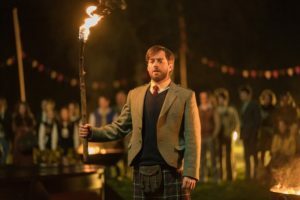 Rankin is never short on charm, and “The False Bride” gives him every opportunity to be that Roger, but he also has the chance to explore the more intense side of Wakefield. 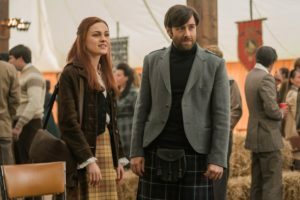 The culminating Bree/Roger relationship scene may prove to be problematic for an audience looking though a 2018 prism, and isn’t helped by awkward, predictable dialogue. Since I’m not a book reader, I have no idea who bears the responsibility for this. NOTE: Given that STARZ embargoes important material until after the Outlander episodes air, I won’t be reviewing episodes here unless there’s a point to weighing in after the fact. Most networks let critics post reviews (and I don’t do spoilers) the Friday before episode airs.